We were organizing an internal challenge and some dore players (Awikii) asked us if they could join the party, and of course we said yes. And now we are here to invite you all. So we have two train servers (one TA one TEAM). Everyone can participate, we will organize several matches, according to your possibilities. 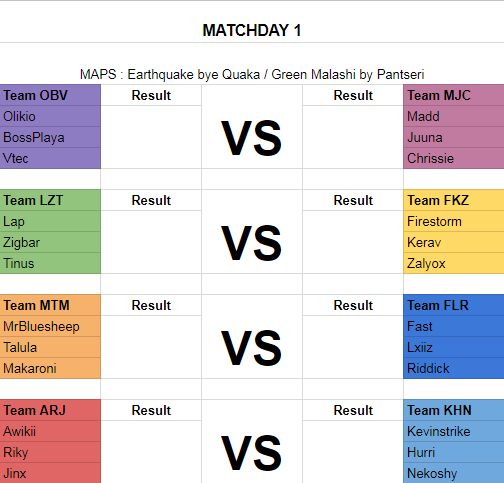 We decided to make mixed teams between dore and spam (+ nwt fast asked to join aswell), these teams will be as much fair as possible, if you are intersted, you can tell us here. The "event" will start very soon. We don't know yet how many teams and players per team there will be but we'll see that when we know who wants to participate. Maps are already available on our servers, there are only 2 because matches will be played with 2 maps only (so it's faster). that sounds interesting. I am definitely interested but due to my rather limited time i cant tell to which degree i will be able to participate. Happy to see your post bobo and of course I am in!!! It will be fun driving in mixed teams and looking forward to some nice races against each other. Other guests please? We would have liked to start the matches this weekend. It should really know very quickly who are the people motivated to accompany us! Maps are easy to train. We will play seriously but the main goal is to spend a nice mement between us We are counting on you ! !Come on Dores !! Go Dores !! Yeye, I'm here unless they overlap with PDC matches. Shame I can't play this weekend. Good luck to you all and have fun. Well, I took the people present during our match to compose groups. There is no fixed schedule (MrBulesheep). The match must be played in the week, you have to arrange between you. You can play on sunday but monday tuesday etc... too ! And of course more but for this weekend only these. Will be possible join later or teams are closed?